The move will end the far south west's only year-round air link to London. Newquay Liberal Democrat MP Stephen Gilbert tweeted that he was "gutted" and it would be a "blow to businesses across Cornwall". In a statement, the firm said: "Following Flybe's decision to cease operating from London Gatwick to Newquay, Easyjet carefully and thoroughly examined the commercial viability of offering year-round services on the route. "Unfortunately, after much consideration, all of the evidence clearly shows that there is insufficient demand to sustain a service using an A319 aircraft with 156 seats." It said newly announced routes to London Southend and Liverpool will "fly thousands of people into the region providing vital support for the local economy over the summer peak". But one businessman, Chris Ingram from Cornwall-based Continental Underfloor Heating, said he was "pretty devastated" about Easyjet's decision. Mr Ingram said: "This is going to make it very difficult. It creates a big question for us, whether to invest money in Cornwall or do we need to seriously think about locating some core functions outside the county." 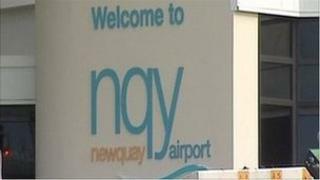 Cornwall Council, which owns Newquay Airport, said it was "disappointed" that the Gatwick route would end. It said in a statement: "Providing a regular air link to London is very important to the economy of Cornwall and we remain in discussions with a number of other airlines to maintain this vital link."